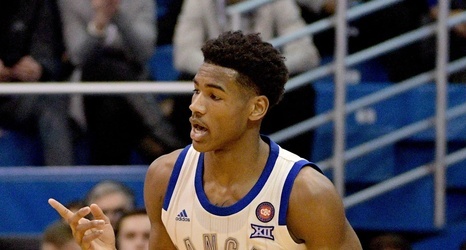 It wasn't clear what this Kansas team, already missing Udoka Azubuike and Marcus Garrett due to injury, would look like without senior Lagerald Vick. Fortunately, at 2-7 in conference play, Oklahoma State was as good an opponent as any to try things out. Kansas forced a timeout just about a minute and a half into the game after a Devon Dotson steal and dunk, but Oklahoma State didn't fade away early. Kansas held a small lead much of the half, but the Cowboys stayed right in it and their last bucket of the first half tied the game going into he locker room, 36-36.